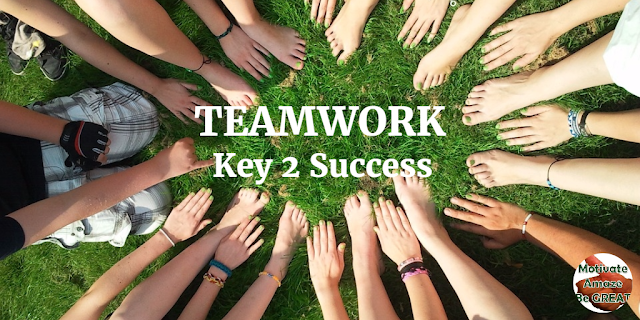 Why Teamwork Is Your Key To Success - Motivate Amaze Be GREAT: The Motivation and Inspiration for Self-Improvement you need! In most realms of life and business, teamwork is the most advanced method that allows achieving more success. Only through the teamwork one can generate, compare, and determine the most suitable solution that could solve issues effectively and reduce the probability of the issue occurring in the future. Whether you are a business owner or a part of a business team, you have probably realized that the teamwork itself is quite an issue that requires effective solutions in order to work. Anyone who has ever worked or managed teams knows that they can be very beneficial to companies but they need to be managed in a specific way that ensures positive outcomes. One person cannot accomplish what can be done by a group of persons simply because the synergy created by multiple people drives the project forward. As the result, work in a team is done more quickly and efficiently because the individual workload is reduced as well as pressure to complete the tasks. Less pressure and reduced workload translate into a better work efficiency. The responsibilities are equally shared and every person does what he or she is supposed to do. In order for the team to work effectively and efficiently, a mutual feeling of respect, trust, and understanding of the importance of cooperation should be developed. Teamwork enables the team members to bond with each other and feel appreciated and valued, thus improving interpersonal relations between the staff members. To accelerate the process of bonding and strengthen the friendship among employees, the team leaders also use different methods, including team building activities. There are a large number of these activities specifically developed for building and improving the relationship and teamwork out there (feel free to check this great list and see which ones can work for you). Even though the pressure on each individual team member is not as stressful as in the case of individual assignments, there is a special aspect of working in teams that increases accountability. Team members who work with each every day do not wish to let each other down because their work tomorrow may depend on the accountability of other members. As the result, the feeling of accountability is increased in teams, which works great for the organizations: the projects may be done ahead of the deadline because increased accountability translates into a better productivity. Professional essay writers (see link in bio), for example, often say that flaws in their work may present additional work for editors, proofreaders, graders, and customer support, so delivering the best work is the only acceptable option. Clearly, if one team member at Google comes up with a good idea, the other ones can improve it even more. It is simply their way of doing things! Sharing the ideas and brainstorming thus contributes to generating the most creative and effective solutions. The teams generally consist of people with different backgrounds and expertise. This could be a great opportunity for less experienced team members to learn from the ones with a more advanced expertise. Thus, collaboration of these people on a project can be a good thing for the organization because every employee has a chance to see how to deliver complex tasks. These skills would not have been obtained if it was not for the need to work in a team. Moreover, the employees have an excellent opportunity to challenge the ideas of each other and learn how to reach a compromise. Well, the benefits provided by the teamwork are certainly great and can make a positive impact on any organization regardless of the business field and the number of employees. Your role as a team leader or a member is to contribute to a positive working climate and continue to develop the skills of collaboration. Eventually, teams will become one of the most important organizational assets all because of the effectiveness of teamwork! Use them to unlock your success and advance your company with every team project you complete!